The story of Judas’ betrayal of Christ and suicide is told in Matthew chapter 26 and Matthew 27:1-5. Judas was one of the original 12 disciples. He is called Judas son of Simon and Judas Iscariot. Iscariot means “man from Kerioth.” Kerioth, known both as Kerioth Hezron and Hazor, was a town located in the northern Negev that belonged Judah (Joshua 15:25). Probably, Judas Iscariot was the only non-Galilean apostle. He kept the community money bag for Jesus and his followers. Judas objected to Mary anointing Jesus’ feet with nard. His objection was that the costly perfume was worth a year’s wages. The nard could have been sold and the money given to the poor. According to John’s gospel, Judas wasn’t concerned about the poor; rather, Judas was a thief and wanted access to this large sum of money. After Mary anointed Christ, Judas went to the chief priests to negotiate money to betray Jesus. The chief priests were delighted with this turn of events and offered Judas 30 silver coins, the equivalent to about 4 month’s salary for a Jewish laborer. Judas agreed on the amount and the chief priests gave the money to Judas immediately. From that time onward, Judas looked for an opportunity to betray Christ that would not cause a riot among the Jews who believed in him. By tradition, Judas hung himself on a redbud tree. 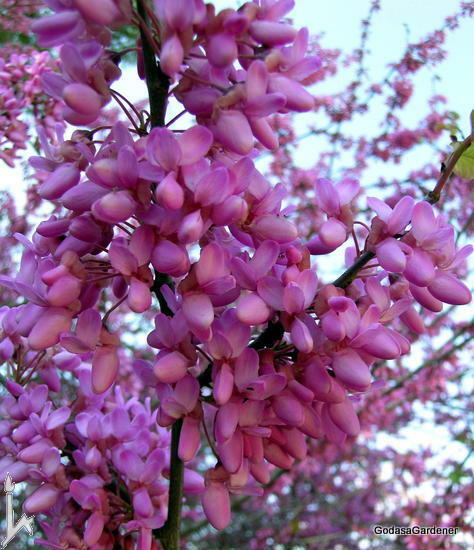 For centuries the Cercis siliquastrum has been called the “Judas tree.” As Judas hung on the tree, the tree’s white flowers turned red because the tree was ashamed that the betrayer of Christ died on it. The origin of this legend is unknown; however, many Israeli gardens, e.g., Neot Kedumim and Jerusalem Botanical Garden, associate the Cercis siliquastrum with Judas Iscariot. Cercis siliquastrum is called the Mediterranean Redbud. It is native to the eastern Mediterranean basin and is widely distributed in the Middle East. The redbud tree grows in the northern and central regions of Israel. Often it can be seen along banks of streams and as understory in tall forests. Cercis siliquatrum can be badly damaged by frost and is less hardy than its American counterpart Cercis canadensis. By tradition the redbud tree felt shame because Judas used it to commit suicide. Ashamed means feeling disgraced, guilty, or inferior. The redbud tree’s shame wasn’t because Judas hung himself; but because Judas used it as the vehicle of his death. Matthew wrote that Judas was seized with remorse after betraying Christ’s innocent blood (Matthew 27:3-4). Remorse includes a gnawing distress arising from a sense of guilt for past wrongs or feeling self-reproach. Possibly, Judas felt both ashamed and guilt. The difference between the redbud tree and Judas was that the redbud tree changed its flowers from a pristine, beautiful white to crimson to atone for its disgrace. Judas’ sin was much greater than that of the redbud tree, yet, Judas made no effort to atone for what he did. Instead, Judas committed suicide to escape his feelings. Reflection: Like the legend of the redbud tree, legends teach us truths. I’m ashamed and guilty that my sin nailed Christ to the cross; but, I am so grateful to have a Savior! This entry was posted in Plants in Holy Week and tagged Bible Garden, Bible Plants, Bible Study, Cercis siliquastrum, Christ's crucifixion, God as a Gardener, Holy Week, Jews, Judas, Judas tree, Redbud tree. Bookmark the permalink. We have a Redbud tree in our front yard. I have read this before as I searched for the identity of the tree. Now, as I pass this tree, and as I gaze at it from the window, I am going to remember that although we all have weak moments in our lives, that lead us to a choice between right and wrong… God is always there to hold us up, and help us to choose correctly, He is just a prayer away. Thank you for this post. I have Eastern Redbud growing in my yard in Northern Indiana. It is so beautiful in the spring. In fact, it’s the most beautiful tree in this season. However, once the flowering season has passed and fall starts, it becomes the most ugly tree in the forest. In the fall, the twisted branches, dark seed pods and uneven bark patterns all stand out. I look at this tree and am reminded that Judas WAS beautiful for a season, but his beauty was lost when he turned away from Christ. His temptation of money overpowered all that he had witnessed in his walk with Christ. In the end, he lost his beauty and became ugly. I am reminded by this tree not to have a desire for anything that takes my focus off of Christ. I am reminded of the consequence of rejecting Christ…death. I also love biblical plant symbolism. Had never heard this about the Judas Tree, the shame of association with Judas’ actions is compelling, but the tree feels nothing, thus, for a tree to change colors, that must be an act of God, or maybe of Jesus since He now has authority in God’s stead to judge all souls, and He withered that fig tree. The color change may be a sign, white to red in the redbud’s garment of leaves; opposite of Jesus’ washing away our sins, changing our garment red to white. White is pure and innocent per the bible, hence, red must represent stained and guilty…could there be a symbolic-parallel association view that the tree represented Judas, he being pure and innocent as was the tree, and was turned by incorrect perception to guilty red by the act of doing as he was instructed to do, as the tree was made to serve Judas that scripture be fulfilled? Could both’s role have been involuntarily? One was foretold to be a Judas, an apostate, had he not betrayed, then who for Jesus was intent on fulfilling scripture? Nahw, Judas was a bad man, everyone knows that, suppose the tree knew it too….shamed to red. Still, I ask, who has not crucified Jesus at least once in their life and did it really matter which tree (sin) we used? . Legends are interesting aren’t they? Thank you so much for this entry. I have been looking frantically for the symbolism behind the Judas Tree. I am writing a paper, and I am beyond thrilled at having found such a wonderful source. I will most definitely make sure to properly cite this website. Thank you for this great words put together. i will share it on my facebook account, someone needs to learn about this. Matthew 24:7? How can one have remorse and yet not atone? Isn’t that a personal communication between that soul and God? I’m so glad only God judges every soul that passes from this world. Suicide is never something that people should turn to and it’s definitely not a Christian’s place to state what one was feeling when they take that last tragic turn. Thank you for your valuable perspective.